I often heard this question asked. Some even ask whether Tai Chi for Health is real tai chi. My colleagues respond in various ways. Most explain what tai chi is and of course Tai Chi for Health is real tai chi. When discrepancies arise, others like Caroline Demoise, use tai chi principles to harmonize different opinions. Some colleagues, in order to avoid a long discussion/disagreement, call Tai Chi for Health an exercise. Tai Chi is, of course, an exercise, just about anything good for health is an exercise, such as walking, swimming, running, tennis, golf, martial art… but is Tai Chi for Health real tai chi?Almost as old as civilization, the claim that certain things are real and to exclude the ‘unreal ones’ exist in different cultures and tai chi is no exception. From the origin of tai chi in Chen’s village, there was already a dispute of what was real tai chi. Actually there is still an ongoing dispute whether Chen is the original style. For the sake of my topic, let assume it is. When the great Chen Fake took his Forms outside his village, he extended the Forms to a larger shape. A dispute began as whether ‘large frame’ or ‘small frame’ was real Chen style. Most Chen style tai chi practitioners nowadays practice the ‘large frame’, yet the voice that ‘large frame’ is not real tai chi can still be heard! When Yang Lu-chan the creator of Yang style modified Chen style to make it gentler and more accessible for people, he was accused of watering it down. Rumour has it that he did it to hide the real tai chi from the foreigners. He was employed as the imperial tai chi teacher, and in the Ching dynasty, the Manchurians were considered to be foreigners by the Han Chinese those days. So the talk around town was still alive that Yang style was not real tai chi, although the majority of tai chi practitioners were Yang stylists. Now and then, many tai chi practitioners would have heard one branch of Yang stylist talk about how real their tai chi is and how ‘unreal’ other branches were. One of the greatest tai chi masters, the creator of Sun Style, Sun Lu-tan, who had an impeccable reputation as a martial artist. They called him the invincible monkey because he was slim and had never been beaten in a duel. Mr Sun was an expert of the other internal Chinese martial art; Xingyi and Bagua before he learned tai chi. In his book he emphasized Sun Style tai chi was pure tai chi, not Xingyi or Bagua. He went on to say that one did not have to know Xingyi or Bagua in order to reach the highest level in Sun Style. I often wonder what made Mr Sun say that in the beginning of his book. Is it possible he was criticised that his tai chi was not “real tai chi”? So what is real tai chi? Tai Chi performed by martial artists? Or tai chi performed by champions of competitions? The answer I believe comes down to what is tai chi? Once you truly understand tai chi then there is no need to dispute what is real and what is not real. Tai chi is unique but also complex, that no one can know it all. It can be many things to many people; it is an art that embraces the mind, the body, and the spirit. principles are adhered – the unique tai chi effect and health benefit will come. True tai chi movements are ones that incorporate tai chi principles. These principles include controlling movements to make them smooth and continuous, move as though there is a gentle resistance, correct posture and weight transference, being Song (loosening) and Jing (mental quietness or serenity). The controlled slow and smooth movements help to connect the mind and body and to have better focus. Song will enhance internal energy, improve flexibility and serenity. The right posture and awareness of weight transference improve balance and coordination. These principles work well whether you are using tai chi for health and wellness or for martial art. A key principle in all tai chi movements is to listen to the incoming force, yield, absorb and redirect the incomin force, to gain control or to reach harmony. This is the essential principle for using tai chi as a martial art. By understanding the incoming force; you can work out a more effective method to gain control of your opponent. Likewise, this principle is a most useful philosophy for interacting and working with others. By understanding others, you can better achieve your own goal. I am so happy to see many famous masters of different styles meet and work together in recent years. Many of them participated in medical studies. 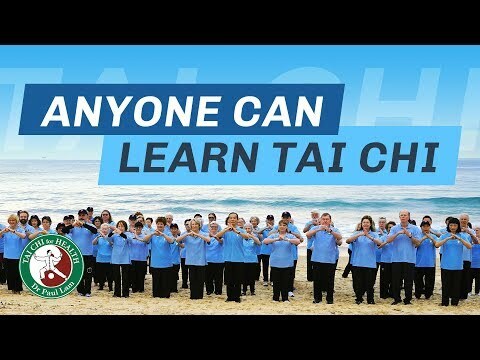 The future of tai chi will be better served with Caroline’s idea of harmony and mutual understanding instead of tai chi people denigrating each other claiming who is ‘not real’. It will be more effective for us to look at each different ways and style as an advantage to bring together tai chi knowledge from different aspects and bring tai chi practitioners together for higher and positive purpose. Working together to practice and carry out research will give us a better understanding so we can gain more knowledge and benefits. If you were asked whether Tai Chi for Health is real tai chi, ask yourself if you have incorporated tai chi principles in your movements. Do remember progress in tai chi is through better understanding and incorporating the principles. You do not have to be perfect before you can claim you are practicing real tai chi. If your movements look like you have incorporated the principles – chances are that you have and you are doing ‘real’ tai chi. At the end of the day, what really matters is how much you have enjoyed your tai chi and how much benefits you have gained.